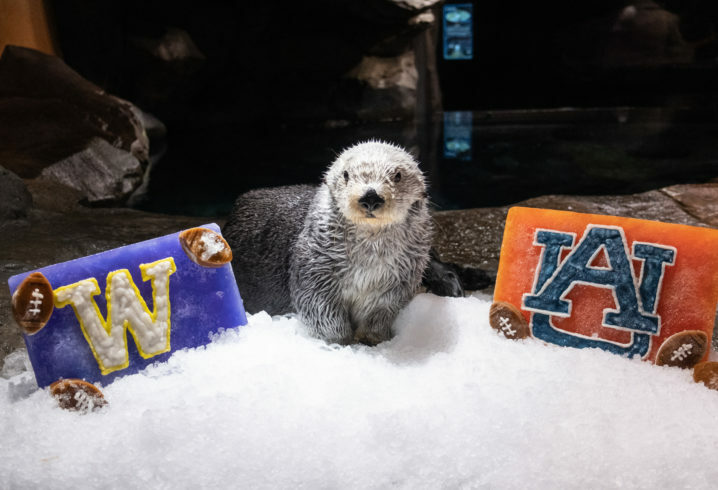 Lee Corso better watch out because Oz the sea otter may be coming for his job. If this is your introduction to Oz, he’s a 17-year-old rescued sea otter from the Georgia Aquarium. Not only that but he likes making college football selections. Before the 2018 Chick-fil-A Kickoff Game between No. 6 Washington and No. 9 Auburn kicks off from Atlanta, Oz made his prediction for the game’s winner. The Chick-fil-A Kickoff Game is the only top 10 matchup of the opening weekend of the season. The game starts at 3:30 p.m. ET on Saturday, Sept. 1 from Mercedes-Benz Stadium in Atlanta. Auburn and Washington have never met on the gridiron. I just bet my house so you better be right Oz. So does this mean Auburn will be dragged under, deprived of oxygen, and chewed up into 50 pieces without mercy? Does this mean Auburn gets taken out, and Washington survives? Or does Oz’s selection mean he likes Auburn, in other words, to win the game.